Allerton Bywater is a semi-rural village and parish of Leeds in the Lower Aire Valley in West Yorkshire and only 2 miles from Castleford. Allerton Bywater was built around small mining communities such as the mining villages of Brigshaw, Hollinhurst and Bowers Row. The River Aire is 71 miles long and flows through the village and at this point the river is canalised and is known as the Aire and Calder Navigation. Lowther Lake is a large lake situated on the edge of the river and is very close by to the disused St. Aidens opencast coalmining site. This site has been beautifully transformed, by the RSPB, into the country’s largest wetland area and of international wildlife importance. The area between Methley and Swillington, covering one and a half square miles, was leased by Leeds Council to the RSPB on a peppercorn rent for 99 years. The valley was dominated by mining before deep mining ended in 1991 at Allerton Bywater Colliery and surface mining ended in 2002 at St. Aidens after extracting about four million tonnes of coal. Today the wetlands are a haven for wildlife and this makes it an ideal place for bird watchers and Lowther Lake for fishermen. The seasons bring an amazing variety of wildlife, wildfowl, birds, butterflies, insects and flora and fauna something for everyone to enjoy. The RSPB are now looking for funding to build a visitors centre and 12 km of public footpaths. Also not far away there is another nature reserve, Fairburn Ings, which is more established and houses many different birds so very soon we are going to take a visit to see what we can find to show you. Please watch part two of Allerton Bywaters and the wetlands in the winter snow you will be surprised at what we find. We park near the end of a no-through side road next to the Ponderosa kennels. We walk past the kennels to the end and then take the footpath to the left of a tall hedge and when we reach the bar stile we go right and immediately left and follow the footpath, only a short way, to Lowther Lake. We now keep to the lakeside until we come to an embankment with the River Aire on the other side and then turn right and follow the good level footpath keeping the river on our left and the wetlands on our right. Now keep a watchful eye as the wildlife is wonderful so don’t forget you camera. We stay on this footpath passing two bridges until we come to a third bridge and a weir. Here we go over the bridge, we can see the Marina in front, but we turn right and follow the path to a road then turn right again along the embankment to the hide. 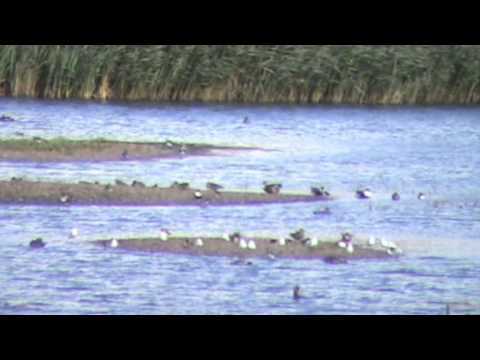 We take a quick look in the hide, entry is only allowed when there is a member there. *We then carry on to a disused lock and a car parking area and take the foot path with a sign, Leeds Country Way, which follows the river now on our right. We walk through a wood until we come to an open area and keep following the path until we see Swillington Bridge. We go through a gate just before Swillington Bridge and then we turn left across the field and then left again and take the path following the canal on our right. We come to a picnic area at Water Haigh Woodland Park and decide to take a break. We then carry on following the canal back to the disused lock and car park area. We then retrace our steps past the hide but then we go over the road bridge and turn left into the Lemonroyd Marina. We carry on forward over a footbridge and follow the footpath with the river on our left and the railway line on our right. We then go over the second bridge and turn right and follow the path we came on then when the path turns left away from the river we carry straight on between the river and Lowther Lake and then we take the next path on the left. We follow this path and then go through the bar stile on the right and back by the side of the tall hedge back to the kennels and our parked car. *Part two of our walk Allerton Bywaters and the wetlands in the winter snow, is a nature reserve of spectacular wildlife, which takes us to the hide then back over the road bridge and then turn left into the Lemonroyd Marina. We then carry on with the above walk, but at the second bridge we retrace the path back to the kennels and our parked car. This is a nice easy flat level walk. Approx 7.25 miles using OS map 289. The winter version is approx 5.25 miles. Woodend, Allerton Bywater near Leeds in West Yorkshire. Take the A64, then the A1(M), then the M1 for a short way. Turn off at junction 47 and then take the A656 Castleton Road. Go over the roundabout then take the second right at the t-junction turn right and Woodend is half a mile. There is parking on the left down a no- through side road near the kennels. There are no public toilets the nearest are in Castleford. For refreshments there is a sandwich shop, fish and chip shop and the Victoria Hotel on the Main Street and also towards Castleford there is the Boat Inn. can u still fish there and if so who much per day? Sorry mr senior we don’t know if you can still fish there because we are walkers and don’t do any fishing. Hi, thanks for the comment we created the theme ourselves trying to make it easy for everyone to use.